Reputation is wealth, it’s what’s left behind after everything you have is taken away. I would like to thank you all for making this community such a prosperous place to spend my time these past eight months and earning us a reputation as a forum rich in ideas, passion and leadership. It attracts the most wonderful people who together know well how to get the best from one another. When so many in this space are looking for power and quick money we have seen tremendous loyalty and hard work. What is wealth without the good intentions of the people who posses the virtue to know what to do with it? Surrounding yourself with the those who can help you achieve your goals is one of the most important decisions you can make in life. I am proud to have spent my time with all of you, thank-you for letting me help. @iawgoM is one person we are all glad to have around. He has brought a creative flare to the place that just wouldn’t be the same without him. The other day he brought us our official Feathercoin Christmas e-card. We are very fortunate to have you with us @iawgoM. Thank-you for all your hard work. If giving were easy it wouldn’t be worth very much. As Jason King from Sean’s Outpost observered: ‘for the first time in history we have the technology to enable one person to help another anywhere in the world’. I was inspired by John Beltzer last week who reached out to us on Facebook eager to tell us about his non-profit called Songs of Love. John and his team write songs for sick children, taking time to learn about their lives and weaving their personal stories and memories in to the lyrics. Checkout this report on 60 minutes. It is gifts like this that money cannot buy. Making yourself so valuable that nobody could ever compensate you. A great doctor gives life, medicine may know how to cure but it’s the healing that John and his team bring to these children. By donating to his charity you are not only helping a worthy cause you are setting an example and paving the way for many others like it. You can download the new Feathercoin Wallet now from the links below. Important: You must upgrade by 31st January 2014 as this is when the BDB lock limit rule change takes effect… whatever that means :- but it sounds pretty serious so I would do it if I were you. It is often said that money goes where it is treated best. @Netnerd is working hard on his cold storage physical Feathercoins with one of the ideas to incorporate Near Field Communication so that the coins could actually be spent like the ones issued by your government. 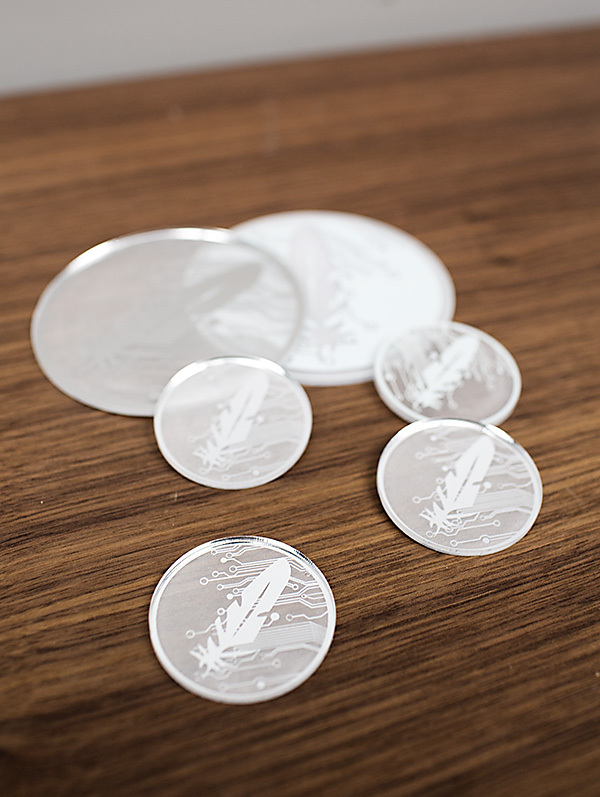 The coins look great in any light and I can’t wait to get these out there. Our badges have already proved popular with me bumping in to people wearing them at London meet-ups every so often. Next I want to see people spending these in shops and bars everywhere. @Kevlar is continuing his work on the Link project aiming for a January release. He is a treasure trove of productivity planning two more Kickstart projects: Enhancements for Link, and a Twitter Tip Bot. More details will be provided closer to the events, like the list of enhancements and how the tip bot will function. You can stay up to date with the latest on the official thread. Ruthie and I are very honoured that @SkullandHeadphones has dedicated one of his track to us, check out his wicked tune! I have never had a track dedicated to me before. Best. Christmas. Present. Ever. Try listening to it while watching his avatar, it’s really trippy! On the theme of music @Calem is planning on forming a global crypto band checkout his thought on the Newsletter thread there and give him a shout if you’re interested. We have spoken before about the universality of maths but nothing brings the spirit of the world together quite like music. I hope you spotted this week’s theme because music is one of the few art forms that we can’t use to hurt one another and one that is never finished in its excessive generosity. This will be the final Newsletter for 2013. Thank-you for making it such a wonderful year. Today special thanks go to @Ruthie & @iawgoM (who did the xmas logo) for their contributions to this newsletter.